Caryle pulled tight the knot holding the last roll of blankets to the back of his saddle, and stood back to survey his packing job. He nodded to himself, pleased. The saddlebags bulged with supplies and there were four rolls of blankets piled on his mount’s withers. He was ready for anything his journey might throw at him; he was sure of it. The young man drew in a deep breath, filling his nose and chest with the cold air of early spring in Dargon. A smile lit up his narrow face; it was great to be following the gypsy roads again. He shrugged his shoulders, settling his cloak around him more securely, and pulled on his gloves. He turned to see whether his companion was ready yet, and the fringe of hair that grew along the left side of his head swung over his eye for a moment. That fringe, about jaw-length and dropping down from just above his ear, was the longest of the hair on his head. All of the rest of the light brown growth was shorn tight to his scalp. Caryle’s companion, the bard Lerillon, was kneeling on the ground, an open leather bag in front of her. The beautiful woman with the long raven hair was removing small amulets and carved figurines from that bag and securing them about her person: looping her neck, wrapping her arm, hanging on her belt, and hooking into her boot. Caryle watched with lifted eyebrow as Lerillon spent several menes decorating herself with all manner of strange jewelry. She finally finished, closed up her bag, and stood. Her well-rounded figure, still obvious even though muffled by two heavy tunics and a good woolen cloak, was now dripping with objects. She turned at his question and laughed, her green eyes sparkling with pleasure. “This is not jewelry, my handsome merchant’s son. It is insurance. We’re one day out from the city of Dargon, and from here to the interior of the kingdom, nothing is certain. Travel is dangerous, paths may be dubious, and we will both need all the help we can get if we want to arrive at our destination.” Lerillon slipped her leather bag into one of the panniers on her horse and proceeded to check over everything secured to her saddle. Lerillon closed the distance between them and ran an ungloved hand, fingers chilly, along Caryle’s cheek. “Such adult assurances. Such worldly knowledge!” She laughed as she slipped her arm under his cloak and around his waist and squeezed him to her briefly, making a type of heat rise within him that had nothing to do with his protective clothing. She kissed him lightly on the tip of his nose and slipped away to return to her horse. Circling around her mount, Lerillon busied herself with the headstall straps for a bit before returning her attention to Caryle over the top of her saddle. She laughed then, bright and dismissive, dispelling the serious aura that her words had begun to invoke. “Besides,” she said as she circled her horse, “I believe in covering every contingency. This charm here,” she said, pointing to a braided horsehair and brass square tied to her upper arm, “is to protect you while riding a horse. But that doesn’t mean I’m not going to double check the cinch on the girth-strap.” She suited words to action, pulling up hard on the strap securing her saddle to the horse’s back after giving the beast a knee in the ribs for extra assurance. Caryle watched Lerillon move around her horse with the assurance of an experienced ostler, tapping at two nails before returning the tools to their pocket. He couldn’t equate the practical woman taking care of those important chores with the kind of person who would wear a jewelry shop’s worth of amulets. It didn’t make any sense to him. He briefly wondered whether traveling all the way to Magnus with a woman he had only met a fortnight past was such a good idea. He had only to recall the previous night’s activities under all of those blankets to push any doubts far, far away. “Will I finally get to hear you sing, Lerri?” asked Caryle as he swiftly checked his knots and girth-strap, and hopped into his own saddle. “Shut up, love-pup, and listen. Tarrum stepped out of his office into the calm weather of a late spring day. He noted the sun’s position on its course to setting, then stared down at the small shrine that stood next to his door. In the center of a carefully arranged setting of rune-carved miniature tools and representations of building materials lay the ritually-prepared capstone of his current project. The master stonemason sneered at the round totem, covered with propitiating symbols to every god and spirit the tradition of his craft knew of, intended to bless and protect the building rising around him. Tarrum had been born into the guild, and weaned on the traditions of stonemasonry, inheriting his great-great-grandfather’s trowel upon his maturity. He had cut stone and laid blocks, carved little details in windowsills and raised up massive retaining walls, with hands still calloused from that work even after two years of wearing the sash-and-baldric of a master. He had stone dust in his veins, but his mind was not mired in the mortar of his past. Tarrum was blessed with vision, and at the same time cursed by the nature of his talents. The Stonemason’s Guild was bound by rigid rules and beset by foolish superstitions. Their construction standards were based on strict sets of guidelines that were founded more on uniformity than the actual structural capabilities of the materials involved. Bridges were supported by arches that were no more than fifteen strides wide, for example, and columns were required every thirty strides in any open room. Tarrum saw things differently, however. Stonemasonry came naturally to him. He had grasped his lessons as an apprentice instinctively, disdaining the guild rituals that others used to gain understanding. In the same way, he intuitively knew that bridge supports could be spaced wider if the right materials were used, and the same applied to columns. The lack of suppo rt for his views had only soured him to the petrified nature of the guild, and had driven him to search for vindication. He had found it, and he intended to prove his revolutionary ideas sound today. Tarrum set off across the construction site clutching a roll of parchment under his arm. His robes billowed around his thin body and long legs as he hurried to the location of the demonstration, determined not to be late. His workers acknowledged him as he passed; he knew that they easily recognized his unruly mop of brown hair and naturally gaunt face. He also knew that their regard came from respect and not requirement. He never wore his badges of rank on site so that they never had to genuflect to some scraps of cloth, and he always treated his workers as he wished to be treated, with due consideration for their skills and abilities. The stonemason reached the area that would someday be the dining hall of the College of Bards and found that he was the last to arrive. Seventh bell hadn’t yet rung out over the city of Magnus, so he strode into the space confidently, knowing he wasn’t late but that they had been early. He knew that their eager anticipation would be rewarded. Sarian and his helpers remained around the table, kneeling and placing their hands on the tabletop, fingertips touching the parchment. Tarrum heard no signal, saw no sign given, but all five pairs of hands began to glow at the same moment. 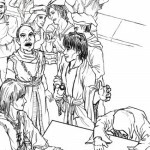 He looked at the kneeling people and saw that the apprentices, two men and two women, had their heads bowed, while Sarian’s gaze was directed at the parchment. Nothing more happened for what seemed a long time. Tarrum had seen this demonstration before, so he had no trouble heeding Sarian’s plea for patience. Some of the bards had also seen it, and they reassured their fellows when quiet questions began to stir. Then silence returned, for something was happening on the table. The blue-inked plans were rising from the parchment as miniature walls of light before everyone’s eyes as the dust and tools vanished. Tarrum watched the under-vaults form, and then the cellars above them. The ground floor’s walls rose up, forming the central rooms and passages, the wings leading off the great atrium, and the portico with its intricate mechanisms. A second floor formed, and over two wings a third. The roofing filled in, complete with ornamentation, as did the windows, and, where one could see within, even some furniture filled the rooms. The model was complete. Tarrum looked at the magnificence of his design of the College of Bards and was pleased. Sarian stood but his hands remained on the table, and his helpers stayed on their knees, heads bowed and eyes closed. The wizard looked at the stonemason, and Tarrum said, “Honored guests, this demonstration was not put on just to show you what your future home will look like. Had that been our only intent, we could have built you a wooden model at far less expense!” He chuckled, and a few of the bards joined in. The rest were staring at the building of light on the table with amazed looks on their faces. On cue, Sarian lifted his glowing hands and began to make passes with them. His mellifluous voice accompanied his actions, explaining the tests he was putting the model through. The audience watched as simulated weight was applied to the roofs and walls, demonstrating that the large spans were structurally sound, and that the buttresses used, uncommonly small, were only needed as the decoration they were intended to be, though they also served to reassure people who expected to see them used in grand buildings. Miniature storms battered the walls, rain hammering and lightning flashing, wind blowing and hail crashing. The table top heaved in a pretend earthquake, and a tiny army attempted to force the doors of the portico as a tiny bard stood on the locking plate with impunity. Everyone laughed at that, since they were watching the tiny bard through large cutaways in the walls that would have made far easier ingress than the locked door had they been actual architectural featur es. Tarrum watched as his design passed the tests Sarian set one by one. The display was fascinating not only visually but in what it represented. He remembered when the wizard had first come to him years ago with the idea of building models out of magic that exactly represented the finished structure in every respect. Tarrum had seen in the proposal the solution he had always searched for, but he hadn’t immediately accepted Sarian’s claims. It had taken months of experimentation before he felt confident that the idea was sound. The stone mason had first used Sarian’s model-magic to save costs in building materials by proving what kinds of loads different types and configurations of stone could bear. The resulting material requirements always ended up being significantly less than the guild’s normal recommendations even after factoring in a safety margin. Then, i n the last project he had overseen, he had used Sarian’s wizardry to prove that he could span a space more than five paces larger than the guild guidelines stated. He was very proud of the resulting annex to Lord Charil’s estate, but he knew that the college would be a masterpiece. Finally the demonstrations were over, and the model college stood without sign of wear. The bards applauded wildly, evidently convinced, as Tarrum had known they would be. Sarian’s hands returned to the table top, rejoining those of the apprentices that had never left, and all five sets of hands stopped glowing at the same time. The model vanished, leaving behind only the table: the plans had been consumed along with the other sundry objects placed upon it. The bards swarmed over the wizards as well as Tarrum, congratulating everyone equally. Sarian and his helpers were persuaded into a round of drinks at a nearby tavern, and soon only two people remained in the dining hall. Tarrum shook the hand of master bard Wernivel solemnly. “Impressive,” said the bard. “I admit that I had reservations about your design, though I gave you the benefit of the doubt based on your previous work, and the glowing reports your mentor Moonik gave of you. Construction may proceed as planned, Tarrum, and congratulations. Your work is groundbreaking, forgive the pun!” Wernivel slapped Tarrum on the back and walked away, leaving Tarrum rubbing his shoulder and feeling very proud of himself. This project would prove to everyone that the guild’s building restrictions were meaningless! Tarrum sat at his desk going over his delivery ledgers in the lowering sunlight and cooling breezes of a late summer afternoon. A shadow fell over the sheets in front of him, and he looked up to find a man standing in the doorway to his shack of an office. The newcomer was tall and broad, filling the opening, his bald head just below the lintel, his muscled arms brushing the edges. He was dressed as a laborer in a sleeveless jerkin and rough leather pants, but the lack of stone dust on his clothes and the gold sash around his thick middle revealed that he was of some rank in the guild of masons. Tarrum gasped, his hand falling limply to his side. He said, “What? How? But … Oh gods!” He felt himself reeling in shock, and sagged against the edge of his desk. If the annex had collapsed then something had gone wrong, but what? He tried to review the entire project in an instant to find fault, but there was one obvious possibility: Sarian’s spell had been wrong, and that magic was what had earned his plans for the Bardic College their approval! Tarrum breathed a sigh of relief, and he felt a weight lift from his shoulders. Lord Charil’s annex was the first building that he had designed incorporating his innovations, and Sarian’s magical model had proved the feasibility of his vision. Lord Charil had been pleased to fund the tests required, since the resulting annex ended up being the largest open internal space anyone had ever built. Tarrum had never noticed any incipient madness while dealing with the man, except perhaps for his willingness to spend that much for an extra set of rooms. Then again, maybe that had just been pride. Roshen replied, “The only thing left standing was the intersection with the old house. Four people were killed, including Lord Charil. Ten others were wounded. The two of them stood, and Tarrum led the way out of the office. He glanced at the capstone in its shrine by the door through narrowed eyes. He hadn’t even prepared a capstone at Lord Charil’s building site, knowing it wouldn’t be necessary. The guild’s close presence here in the city hadn’t let him get away with not preparing one for the Bardic College, but he had no intention of installing it, even with Roshen’s news still fresh in his mind. He saw no reason to set aside his convictions. He led his friend around the building site. The outer walls had grown to head height, and the non-load-bearing internal walls were already starting to divide the space up. Roshen was suitably impressed with the growing structure, marveling at the size of some of the internal spaces. Tarrum let himself be cheered up by his friend’s appreciation. He needed to finish this job, and he couldn’t let thoughts of the annex interfere. At one end of the site was a large storage area. As Tarrum showed Roshen how it was organized, he was interrupted by a late delivery. He let Roshen take charge of comparing the manifest against the contents of the wagons as they were unloaded, glad that he could finally shift that responsibility to someone else. He was a little surprised at the number of people it took to unload each wagon until he realized that only three quarters of them were actually moving the stones. The other quarter were pacing around the growing stacks on the ground, waving their hands and chanting. Tarrum shook his head and muttered imprecations at yet another guild practice that was more ritualistic than practical. Then he paused; he hadn’t had any blessers at the Charil annex site. The two stonemasons strode back across the construction site as ninth bell rang out. Tarrum found his thoughts returning to Roshen’s news, his mood again growing as dark as the approaching night. His greatest creation to date had been destroyed by a crazy man. It didn’t seem fair that a structure of sturdy stone could be demolished so easily by a mere weak mortal. How had Charil done it? Could he have made the addition safe against madmen? Maybe he would ask Roshen for more details over some Oily Octant ale, even though he knew he should just let the matter lie. He consoled himself with the knowledge that one man could not knock down the Bardic College, no matter how big a pick he might wield. Tarrum hurried into the Justice Hall and found a seat on one of the uncomfortable stone benches that lined the semicircular half of the room. The droning voice of the guild’s secretary was already filling the space, which eased Tarrum’s worries. He had received an official summons to the reading of the findings of the Charil annex accident investigation, even though he had never been interviewed by the guild’s examiners. His lateness hadn’t been a reason to keep the proceedings from starting, which meant that there would be no surprises for him today. Tarrum looked down at the floor of the hall. A low dais in the center of the back was surrounded by empty chairs and benches where the participants would sit if this was an actual judicial investigation, instead of just a reading. On the dais was a podium, behind which stood the guild’s secretary, a nice-looking young woman with a voice that could put a rushing river to sleep. Tarrum knew that she wasn’t just being staid for the sake of the formal proceedings either; her voice was like that all the time. At the back of the dais were two chairs. On the left, officiating for the guild itself, sat the personal assistant of the master of the guild. On the right sat the king’s justiciar, officiating for the crown. Both men seemed attentive, but the proceedings were just beginning. The droning voice was in the midst of recounting the physical findings of the investigators, so Tarrum’s attention wandered to the rest of the room. The Justice Hall was like the rest of the buildings belonging to the stonemason’s guild: a monument to the craft. Tarrum, however, found that its grand design was claustrophobic rather than uplifting. It felt closed in and confined to him, chiefly because he knew he could build walls both taller and farther apart. A great deal of skill and artistry had gone into the construction of the building, but it was mired in the past, limited by design parameters that had been set hundreds of years ago and never tested since. It was a monument to stagnation as far as Tarrum was concerned. The grey Ober day visible outside the grand windows did nothing to brighten the stone-colored room. The guild had determined not to decorate their building with anything not created by their members, and Tarrum felt that the monochrome results made the room even gloomier. He thought about the frieze being carved into the central atrium of the college which would be painted to enhance the carver’s skill, and wished yet again that tradition wasn’t so heavy within his guild. Tarrum winced at that pronouncement. Those buttresses had been sufficiently strong enough to support the annex, for all that their measurements were well below the guild guidelines. “Weakened state” was just them covering their own ignorance! “Ordinarily,” the secretary continued, “the investigation would have ended there, but certain accusations by survivors of the accident prompted further questioning.” Tarrum had an idea of what those questions were, thanks to Roshen, but his foreman had not been able to provide all of the answers, so Tarrum listened closely. Tarrum was astonished at the extent of Lord Charil’s madness. He also wondered why the guild, chiefly concerned with stone and architecture, had inquired into the client’s sanity. The audience gasped. Tarrum would have joined in if he hadn’t already heard of it from Roshen. The accusation bothered him, but he couldn’t believe in it. Buildings didn’t drive people insane; it just wasn’t possible. This time Tarrum gasped along with everyone else. The secretary paused, letting quiet return, before continuing, “Lords Miriki and Prenhad, both friends of Lord Charil and frequent visitors, reported fluttering wall tapestries even when there was no breeze evident. This happened several times, and each saw it independently of the other, though never at the same times. Another gasp filled the room, followed by a low murmur. Tarrum hadn’t heard about any of these other strange happenings, and they increased his uneasiness. One man going crazy was the kind of isolated incident that really could be assigned to bad luck. Four other people seeing strange things, however, might well turn bad luck into something else. He had a thought, and glanced around to see Jentol seated off to his left. His former employee had a resolute look on his face, and Tarrum wondered why the young man hadn’t reported his observation to him. “None of these reports were able to be corroborated even though none of the observers were alone at the time. In answer to the accusations of Wrissa, the guild investigators brought in diviners and mages, but no eldritch influences could be found. The only determination possible was hallucination since no physical or structural evidence of these aberrations was found. “In conclusion, the guild has absolved those involved in the construction of the Charil annex of any culpability in the collapse. No resolution has been filed in relation to the hallucinations. Tarrum didn’t. It didn’t make any sense. Needing time to think, he said, “Thank you, Jentol. Fare well.” He turned away and left the hall, but not before glancing up at the capstone one more time. Tarrum walked slowly, turning this new information over in his mind. He made his way across the city and back to the construction site. Most of the ground floor had been roofed in, save where the space was intended to span more than one floor, but Tarrum didn’t even notice the progress on the College of Bards. His feet took him to his office, and he stopped just outside the door. He stood for a long time, staring at the capstone sitting there in its shrine. His thoughts had nothing to do with guideline-expanding theories or magically-tested construction techniques. He had already dismissed Lord Charil’s actions as those of a madman whose problems had no connection to the room he had destroyed. The other hallucinations, however, were not so easily rejected. They all shared a common link in that they had concerned the annex’s construction, which bothered him most of all. He had never heard of such a concentration of strangeness connected to any other newly-built structure, which forced him to consider whether or not the room had really had something wrong with it. Was his vision incomplete? Were the guild’s strictures more than baseless superstitions? Had he and Sarian failed to take the capstone into consideration when modeling the annex and the college? Was there some other force at work which couldn’t be encompassed by a simple stress versus load experiment? Did he have the right to take the same chance with the College of Bards that he had with Lord Charil’s annex? Caryle followed the bard Lerillon into the great atrium in the College of Bards in Magnus. He gazed in wonder at the huge, open, soaring space, filled with light and even planted with trees, that was the center of the large building. Lerillon’s story back in Mertz about the stonemason Tarrum had not exaggerated his skill if he had really created the idea for this magnificent building all on his own. “Right in the center,” she said, pulling him closer and resting her cheek against his as if to guide his eyes to the right point with her own. Caryle grinned wider. “Fair enough. Sssss–” He laughed when her eyes widened, and he finished, “–so, I choose the room.” He jumped to his feet and said, “Last one there is on the bottom!” Her shriek of mock outrage followed him only a moment before her footsteps did as he dashed through Tarrum’s magnificent atrium, laughing wildly.